Hornsey was first recorded in c. 1195 as Harengh, from the Old English haering, meaning either Haer’s or stony place, and previous to that was likely settled by Saxons (it lies west of the River Lea, which marked the eastern limit of the Viking Danelaw). The church of St Mary was built here at least as long ago as the thirteenth century, on a large tract of land largely owned by the Bishops of London (and used by them for hunting). 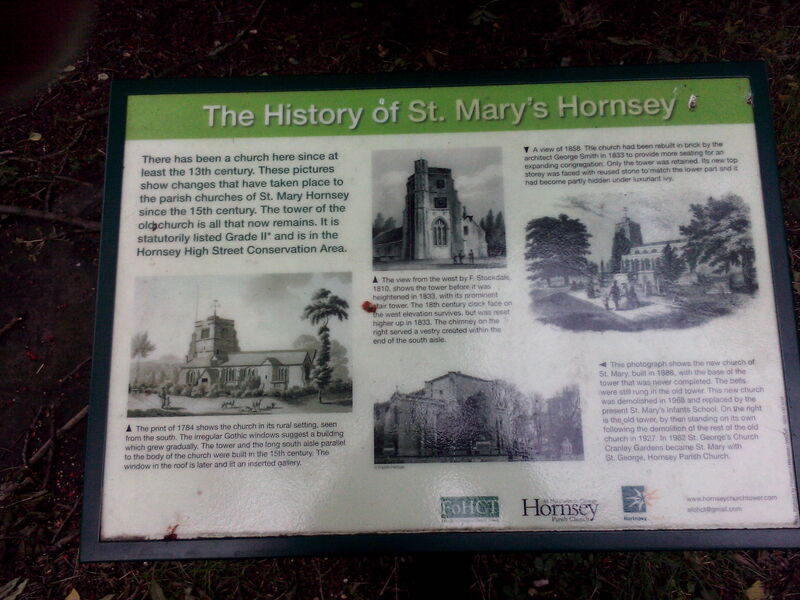 The associated parish and manor of Hornsey, which extended as far west as Highgate, remained largely rural until the coming of the railway in the Victorian period, after which it became suburbanised, while still retaining many green spaces. The “New River” was built through it in the seventeenth century, having to cross the then “long, irregular and scattered” high street of the then village of Hornsey in three places (the street has since been straightened). The “old” church of St Mary was built here at least as long ago as the thirteenth century. It was rebuilt in the fifteenth century, and again in the nineteenth, in 1833, and substantially demolished in 1927. Only the tower remains today, the lower part of which dates to the fifteenth century, and the upper part, faced with re-used stone so as to match, to the nineteenth. The “new” church of St Mary was built on an immediately adjoining site in 1888, and demolished in 1968, to be replaced by the present St Mary’s School. The parish was merged with that of St George Cranley Gardens. This entry was posted in Far flung London and tagged St Mary Hornsey on July 23, 2015 by Bob Jones - The Lost City of London. Looking forward to reading your book when it arrives. K.